A black and white photograph of the John M. Lowes house. 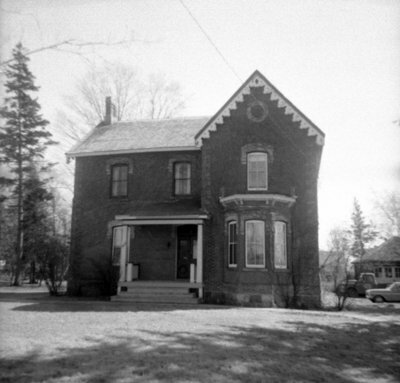 This house was located at the south east corner of Dundas and Frances Streets (at 509 Dundas Street West). It was the residence of John M. Lowes, a Whitby dry goods merchant. It was built about 1871 and was demolished in 1972 to make way for a gas station. John M. Lowes Residence, 1969, Brian Winter. Whitby Archives 17_085_001.